For over 100 years RWS has produced ammunition at the Furth-Stalden, RUAG Ammotech factory in Germany and has been the choice of various Olympic shooters. Rheinidh-Westfalischen Sprengstoff or RWS is a part of Dynamit Nobel, now under the RUAG group, known for making Geco ammunition as well as DAG. Making the cartridges to exacting standards, RWS delivers quality ammunition at affordable prices. 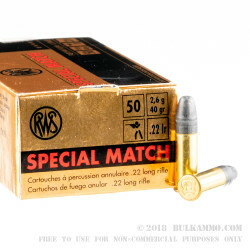 The RWS Special Match .22 long rifle ammunition is made to be a dependable, inexpensive .22 ideal for long training sessions, target shooting or plinking. 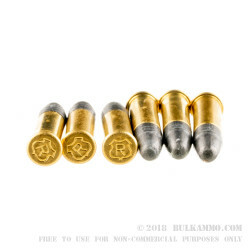 Each RWS .22 is loaded with a 40-grain lead round nose projectile in a brass rimfire cartridge. 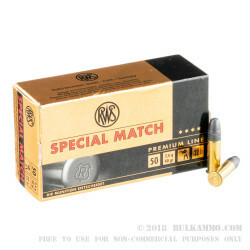 Made to be a close facsimile to the premier RWS R-50 line, these rounds are perfect for match practice and have similar characteristics and accuracy. 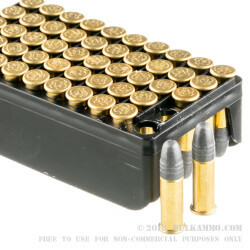 Each box comes with 50 .22 long rifle rounds from RWS.